The Pew Forum on Religion & Public Life interviewed Dr. J. Peter Pham on June 10, 2005, following a roundtable on “Vatican Foreign Policy in the New Pontificate,” co-sponsored by the Forum and the Council on Foreign Relations. 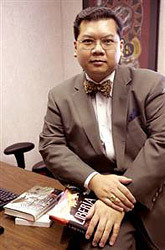 Dr. Pham is the author of Heirs of the Fisherman: Behind the Scenes of Papal Death and Succession (Oxford, 2004), a former Vatican diplomat and a frequent commentator on Vatican history and policy. He discussed possible trends in Vatican foreign policy under Pope Benedict XVI, including developments in the Vatican’s relationship with the People’s Republic of China and Vietnam. He also spoke about Pope Benedict’s views on Islam, Judaism and Pentecostal Christianity and efforts toward rapprochement with the Eastern Orthodox Church. His comments are posted below. How do you think that the Holy See’s foreign policy under Pope Benedict XVI will compare with the policy trends under John Paul II? There is going to be at least outward continuity with John Paul II’s pontificate simply because it is in the nature of the institutional structure of Catholicism. However, I suspect that the conventional wisdom that Benedict XVI is simply a transitional continuity from John Paul is wrong, in the sense that his personal orientation, theological vision and his vision of what the church can and ought to be in the world today will lead to the creation of an entirely different focus. His greater long term impact may be on the life of the Catholic Church internally, where his emphasis is, and on the role that Catholicism and religion in general play in our society today. How will that different focus shape the foreign policy priorities of the Holy See? Unlike other popes, including John Paul II, who came to their office with very little behind them, Joseph Ratzinger became Benedict XVI with a very long academic and scholarly paper trail. His writings and lectures, including a very important one he gave at the Benedictine monastery of Subiaco the day before John Paul II died, indicate that his emphasis and interests are – unlike John Paul II’s – not turned outward to social and political issues but toward internal, doctrinal, theological and even liturgical issues within the Catholic Church. In that respect, there will be less outward exposure or signs of the Vatican’s foreign policy. However, this internal consolidation will have its impact on the “soft power” that the Catholic Church has throughout the world. What are some examples where there will be applications of soft power in new ways? John Paul II was a man of tremendous dialogue, not just with people from different cultures, but also from different faith traditions. While Benedict XVI has great respect and affection for the Jewish community in particular, his real interests are in Eastern Orthodoxy and achieving a reunion of the Church of Rome and the Orthodox churches. This would have profound geopolitical implications throughout Eurasia. Benedict XVI has also been very skeptical of the expansion of the European Union, especially as Europe has post-Christianized or secularized, and he is very wary of the incorporation of significant populations and predominantly Muslim countries into Europe. Certainly whereas John Paul II pushed Vatican diplomacy to favor the inclusion of Turkey in the EU, I suspect there will be a very subtle, discreet backpedaling on that under Benedict XVI. These are very real issues that flow from a theological vision. On the question of liberation of certain countries, I think Benedict’s emphasis – which is less on human freedom and more on the survival and continuity of the church and its abilities to carry out its sacramental and liturgical life – will lead to a modus vivendi of some kind with the People’s Republic of China. Perhaps this will be along the lines of the Vatican’s modus vivendi with the government of the Socialist Republic of Vietnam, now more than a decade old, where the government is given an effective veto over the appointment of bishops while the church is allowed to function openly in society. So that’s going to be another diplomatic opening, if you will. In areas of the “global South,” diplomatic pronouncements will probably be made on human dignity, but I think they’ll be less impassioned than they were under the pontificate of John Paul II. On the other hand, there will also likely be less micromanagement of positions that local churches take on the issues that may not impassion the new pontiff as much as they did his predecessor. During a June 7 meeting with the president of the Italian Chamber of Deputies, Russian Orthodox Patriarch Alexy II appealed to Catholics and Orthodox to address together the “negative anti-Christian tendencies” present in Europe. He added that he counts very much on Benedict XVI to work together “against violence, egoism and moral relativism.” Just a short time before this, on May 26, German Cardinal Walter Kasper, president of the Pontifical Council for Promoting Christian Unity, proposed a synod of reconciliation to the Orthodox, and an alliance with the offspring of the Protestant Reformation, in order to rediscover the Christian roots of Europe. In light of these events, are we not also witnessing an “ecumenism of the trenches,” driven by the pressures of an increasingly secularizing Europe? My intuition is that, given Benedict XVI’s theological outlook, ecumenical efforts in his pontificate will occur at several levels which will occasionally overlap. For reasons of ecclesiological affinity, the bulk of the energies dedicated to formal rapprochement will be expended in the direction of the Eastern Orthodox churches, many of whom have already responded very positively to the pontiff’s initial words and gestures, including the declaration he made at the sanctuary of St. Nicholas, a figure honored in both East and West, in Bari in late May. However, in confronting what the then-Cardinal Ratzinger described as the “dictatorship of relativism” in the West, there will be another “practical ecumenism” involving increased cooperation – if not certainly movements toward formal union – between Catholics and Protestants and other traditionally oriented Christian groups. We have already seen this in the United States, for example, where during the pontificate of John Paul II there was a great deal of “coalition building” between conservative Catholics and liked-minded Christian evangelicals. I expect more of this on a global level. Finally, given some of reservations that the new pope has previously expressed about Islam, one should not be surprised if this “practical ecumenism” were to extend not just to zones of Christian-Muslim strife like West Africa, but also to new fronts like the Middle East where Benedict has articulated a deep respect for Judaism while being noticeably cooler toward Islam than his predecessor’s diplomacy. Sometimes it’s said that the three most dynamic religious movements in the world are Islam, Pentecostal Christianity and Roman Catholicism. How do you expect Benedict XVI will position the Vatican globally with respect to Islam and Pentecostal Christianity? Despite deep theological differences with Pentecostal Christianity, in many respects, Benedict XVI’s theological writings as a scholar show a conception of the church that is remarkably similar to a Pentecostal vision of the church of the pure and the elect, a very dynamic church as opposed to a mass movement that is more concerned with numbers; the idea of a saving remnant. These are all ideas that perhaps under different vocabulary terms would find great resonance in the Pentecostal community. On the other hand, I think with Islam it is going to be a little more troubling. In his past writings, Benedict XVI has raised concerns about Islam, both as a sociological influence in a postmodern Europe and as a theological question. He has spoken with great affection and reverence for the Judeo-Christian tradition and the spiritual heritage that Christianity derives from Judaism. To date, his writings, at least as a scholar, have evinced a more cautious attitude and adopted a more critical perpective with regard to Islam. Do you see possible conflict between the Vatican and the United States on foreign policy issues of peace and the “war on terror”? I think that actually the greater conflict might be on certain socioeconomic questions. Joseph Ratzinger hails from a German tradition of the social market. Social issues have never been privileged in his writings or personal interests, but such writings that exist tend to favor a social market which many European statesmen, as well as churchmen, juxtapose against what on the European continent is often dubbed the “Anglo-Saxon model.” Given his personal affinities and experience, it will certainly be much more difficult to spin his statements as a blessing for the American economic system in the way that some of John Paul II’s statements – Centesimus Annus, for example – were spun by certain thinkers in that direction. On the other hand, insofar as there is a perceived conflict in the world between American power, representing a Western power, and Islamist tendencies within the Muslim world – as much as our government tries to deny that such a conflict exists – this may not be unwelcome by the current pontiff. An Egyptian professor, Zaynab Abd Al-Aziz, argued on Saudi Arabia’s Iqra television network late in May that the Vatican was resuming its crusade against Islam and that America was its instrument. While I think that the scholar’s remarks can be dismissed as delusional and part of the unfortunate tendency for conspiracy theory in the Middle East, on the other hand, if such a crusade were to materialize – unlikely and, in any event, it would never be so characterized publicly – I suspect there are certain quarters around Benedict where such a development might not be unwelcome because it would bring greater clarity to a conflict that many believe already is taking place in Europe. You wrote in your book Heirs of the Fisherman (2004) that the next pope would have to be a spokesperson for “more equitable economic development and political empowerment.” Will Benedict XVI be such a spokesperson? How will his response to these issues affect his relationship with the Catholic Church in the “global South,” which wants such a spokesperson? Well, Catholics in the “global South” are the church’s core constituency, doctrinally and demographically, as Philip Jenkins and others have pointed out, so Benedict XVI cannot fail to address their concerns. If it is not necessarily with the great passion that John Paul II engaged these issues, it is unavoidable for the pontiff in the church today to engage in them in some way. The German tradition of church engagement in social doctrine predates Leo XIII’s engagement at the global level. Benedict XVI comes out of that historical background, and it might well be that in his personal disengagement, he also empowers local churches, which have more or less been restrained in the past, to speak on their own right and address their own local concerns. In that respect, an apparently “hands off” approach from the center might not be an unhealthy development.